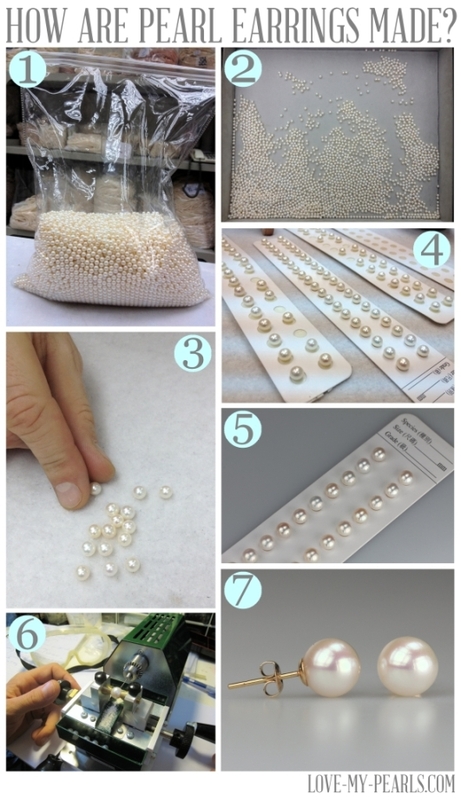 Have you ever wondered how pearl earrings are made? What happens before you wear a pair of well-matched pearl studs? It is a long process! It all starts with a big bag filled with pearls that have already been sorted for their body color, size, shape, and surface quality by the pearl farm. The bag you see on the first photo is actually considered as a small one. Sometimes we have to go through four times as much to find the “pearlfect” fit! We work in batches. We always go for the bag with the very best quality pearls. We divide them into several trays and search for the most lustrous and roundest of these pearly beauties. Sometimes we feel like a team of Cinderellas, separating the good grains from the bad! Naturally, the more pearls we take out of the tray, the more we risk considering as good ones because some of the remaining pearls will suddenly look better if left with the less-lustrous ones. This is why once we have made our initial selection we inspect every single one of them to make sure you get the best, the roundest, and the prettiest of them all! On this second pass, we take out quite a bunch of the ones we had initially selected. The ultimate beauties get their spot on a sorting leaf. Then the pairing process can finally begin! It can be hours before we start pearl matching. Our skilled staff makes sure your pearls look as identical as each other as possible. Absolutely perfect matches are very rare and a whole lot more expensive because, like snowflakes, each pearl is unique! We carefully study the size, body overtones, and luster of each pearl that matches our quality requirements. We look for pearls that reflect the light in similar ways and display similar color play on their surface. It’s not an easy task! Just to give you an example, white pearls can have pink, silver, greenish, blue, ivory, or multicolored overtones. Not all pearl companies work in this way. Many cut corners and leave the matching process to pearl wholesalers. Such companies buy paired pearls in bulk and hope for the best, which is unfortunately far too often wishful thinking. This is yet another reason to only choose reputable pearl vendors who only carry only high quality pearls. Let’s go back to our pair of earrings. We have already selected finest pearls. Now we have to drill them before we can affix earring findings onto them. This is an optional step because oftentimes pearls are already drilled at pearl farms and ready for setting. Again, drilling pearls requires skills and attention. You don’t want to damage the pearl surface! Once pearls are drilled, they are ready for setting… and voila! 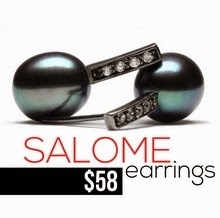 Your earrings are ready to adorn and be admired!